Heads bent down, eyes glued to the screen and fingers tapping away furiously, courtesy Smartphones is what you see everywhere. This handheld device has become such a commonplace thing that you can get a really good one at a dirt cheap price. If you have a problem with me terming it as dirt cheap, then think how costly Smartphones used to be even a few years back. Owning a Smartphone in the past was more of a luxury than a need. And now, you need not even wait to save up and get your choice of Smartphone, which are superb both in terms of style and functionality. Here is a list of the latest mobile phones under Rs 5,000. Samsung is one of the most popular brands offering Smartphones. There are quite a few number of Samsung Rs 5,000 range mobiles. Let’s check out two of the best handsets available in this range. Samsung Z2 – Samsung Z2 is a 4G enabled (VoLTE) Smartphone that is not only affordable but also comes in a compact size of 4.0 inches. Powered by a 1.3 GHz Quad-core processor, the Tizen OS, a 1GB RAM and 8GB of internal storage, an 8MP camera, and a Super AMOLED display, it is a great choice considering the price tag. Available in three color variants of Gold, Red, and Black, it is available for just Rs 4,590. The latest ones come pre-loaded with JIO services. Samsung Galaxy Star Pro Duos – This one is from the Samsung Galaxy range. It runs on Android Jellybean v 4.1.2 with a battery capacity of 1500 mAH, which runs up to 15 hours. Storing all your precious moments and music is no more a problem given that this handset comes with an internal memory of 4GB, which is expandable up to 32 GB. The camera is of 2MP and the handset is Wi-Fi and Hotspot enabled. 1) Micromax Canvas Spark 4G – Micromax Canvas Spark 4G is a multi-touch phone, with a display size of 5.0 inches. Priced at Rs 4,999, enabled with the capacitive touch screen, an internal memory of 8GB and a Ram of 1GB, it is a pretty good choice. The Android version for this model Marshmallow V 6.0 and comes with a 5MP camera and a LED Flash. 2) Micromax Bolt Q381 – Micromax Bolt Q381 is a 5.0 inch touchscreen phone with an 8 GB of internal memory and a 1GB of RAM. It runs on Android Lollipop V 5.1. It is compatible with both 2G and 3G connectivity, besides the Bluetooth and Wi-Fi connectivity options. It has a decent camera of 5MP and the video recording capacity of 720p. 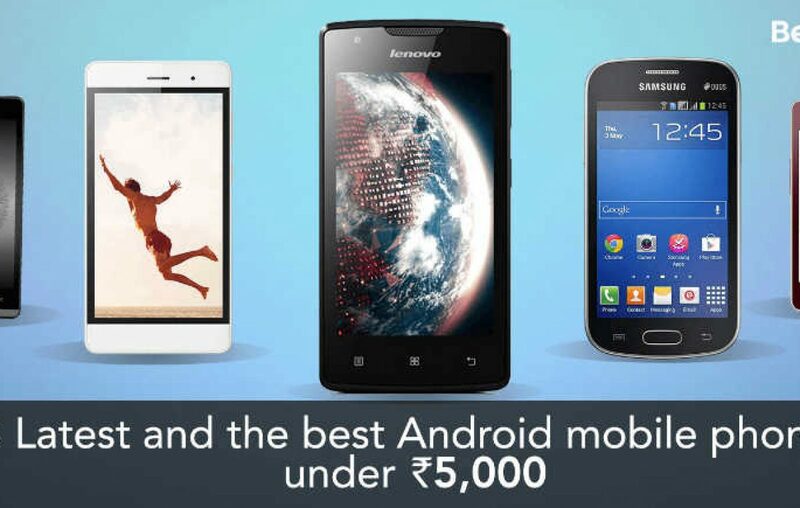 This is one of the most popular Android Smartphones below Rs 5,000 and is priced at Rs. 3,999. However, price comparison for this model is a must, if you want to save on it. One of the best smartphone models from the house of Lenovo is the Lenovo A1000. Although this brand has been at the top of the list for best laptops, it took the market by a storm when it released its first Smartphone. Lenovo A1000 – Priced at Rs 3,575, this model is a steal! It comes with an internal storage of 8GB, which is expandable up to 32GB. Now, you will have no problem listening to your favorite music or reading your e-book on the go. It is a compact handset of 4.0 inches, powered by 2000 mAh Li-Po battery. It has a talk time of up to 9 hours, comes with the Dual SIM facility and a camera of 5MP. Don’t you think that this Smartphone is worth more than its price? Few other Android models in the list of the best Smartphone below Rs 5,000 are Xolo Era 1X priced at Rs 4,999, Lyf Flame 8 priced at Rs 4,709 and Intex Cloud String HD available at Rs 4,999. There are several other brands and models in this category that are popular. If you can think of any other good models, do share with us.